As I previously mentioned, our decision to spend four night of Succot camping left us with the challenge of building a succah for our campsite. 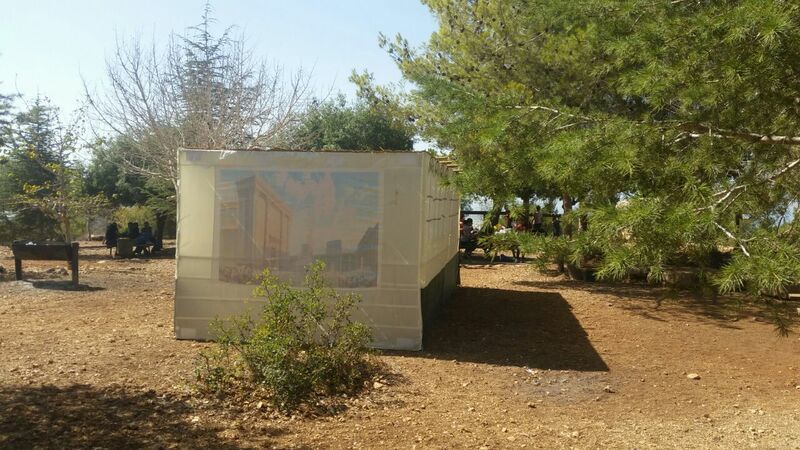 This succah needed to kosher, it needed to be transported compactly, and it needed to be easy to assemble once we reached the site. The Minshayot in Sukka tell us that the minimal size of a kosher sukka is 10 tfachim high and 7 tfachim on each side. We estimate a tefach as 8cm so 80cmx56cmx56cm, which is quite compact. So how to construct our mini-sukka? There are many guides for DIY sukkah construction using PVC pipes. The problem with this is that PVC pipes are less popular in Israel than in the US, so I found that I was very limited in terms of what I could buy. On the other hand, the town where I live has hundreds of piles of agricultural waste and scrap wood, so I decided to see what scrap-wood I could find. After a few minutes of visiting the piles on my street I hit the jackpot: someone had thrown out a heavy wood Sukka wall with a bit of water damage. I brought it home, took it apart and soon had four posts and two interlocking beams. I salvaged some wood from my attic for another two beams and had a frame about 1 meter-cubed. I added some screws so that the beams could easily be locked together with heavy zip-ties upon reaching the campground. The gemara in Sukka specifies that the walls of a sukka must be strong enough to withstand a common wind. For the walls, my wife suggested using some old heavy plastic tablecloths we have lying around. I brought along a staple gun to fasten these to the wooden frame. I also brought a spade to bury the four sukka posts a couple centimeters in the ground to keep them stable so that there would be good tension in the wall fabric. On a practical note, I'll just point out that the cheaper plastic tablecloth was stronger. The nicer, softer tablecloth had a tendency to tear where it was stapled to the posts, especially when a kid would lean against a wall. This problem wasn't terrible, but I did have to re-staple walls a couple of times, so pick your wall material carefully. 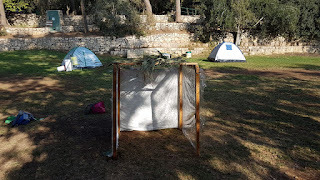 Due to limited room in the car, I had planned to forage for schach near our campsite, but when we stayed at my inlaws the first days of Sukkot, it turned out they had some extra palm fronds. We took these along to the campsite and it turned out to be a good decision since Ein Hemed is a very small, well-tended national park and there are not many branches lying around for the taking. 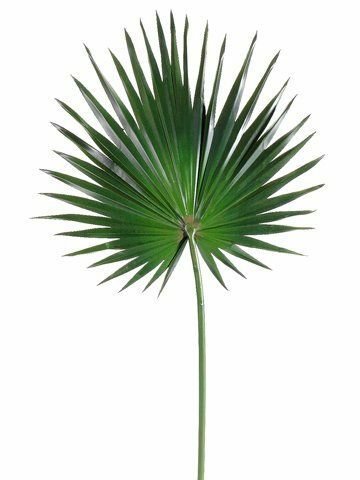 A couple family members declared that to use palm fronds for schach, one must manually separate the individual leaves from one another. I had never heard of this, but I was worried that, after a few days in the sun, the individual leaves would droop into the succah, thus violating the prohibition of Dira Srucha. 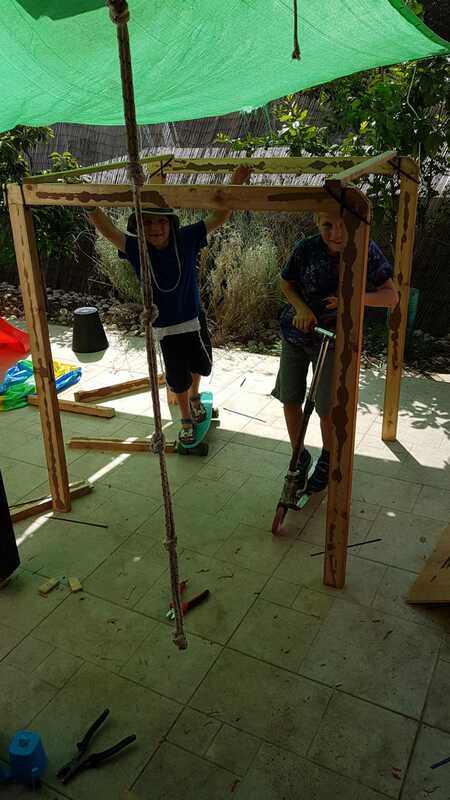 The Halacha states that schach whose tips hang under 10 Tfachim invalidates the succah. Regarding the former, the prohibition of Dira Srucha should proceed the concern over seeing the stars. Besides that, I don't understand the claim, since at the extremities of the palm leaf there are gaps through which one can certainly see the stars. Regarding the latter, the shulchan aruch repeates the gemara's language of "boards". Since palm leaves are not boards, nor do they look like a roof, the gzeira shouldn't apply. Here is a psak along those lines. 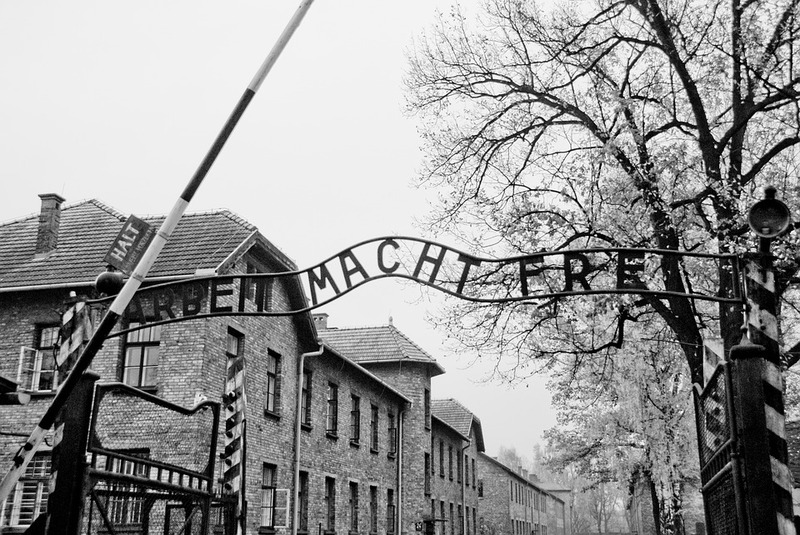 So I'm kicking off a short series of posts that are a bit different in the sense that they deals with practical halachic matters. The reason I'm writing these post is that I didn't find a lot of information on the Internet about how to keep shabbat while camping. Add Succot into the mix and you have a considerable Halachik construction problem on your hands. As such, I'd like to contribute my own little experience to this literature.